It’s the time of year where we like to look at some of the best (and worst) blackjack games in Las Vegas. Today we’ll look at the Vegas Strip since that’s where most visitors in Las Vegas tend to stay. Since higher limits games often have more player-friendly rules we’ll check in on the best games for lower rollers. Blackjack on the Vegas Strip isn’t very good for low rollers. 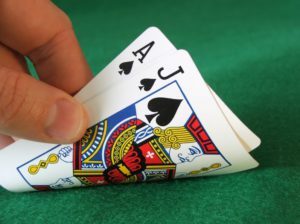 The vast majority of blackjack games with a minimum bet under $25 pay 6:5 when a player is dealt a natural blackjack. Without any other rules changes, this swings the house edge 1.39% in favor of the casino. Add in other rules changes and you have an entirely different game. Well, blackjack rules on the Vegas Strip can get worse from there. In fact, some of the worst blackjack games in Las Vegas are on the 4 mile stretch of Las Vegas Boulevard. We’ll touch on that lagter. One of Las Vegas’ gambling guru’s John Mehaffey visits every casino in Las Vegas to track down rules and payouts for the different table games. Thankfully all of the games are separated and we can focus on blackjack. For the sake of simplicity, we’ll stick to traditional blackjack. Variants like Blackjack Switch or video blackjack won’t be covered here. The minimum wager for these games is usually $10 or $15. Lastly, we’ll only look at games with a house edge below 1 percent. Treasure Island and The Cromwell have the most player-friendly blackjack games under $25. Both casinos are very different but The Cromwell might be the better option for anyone that likes a variety of games. The casino formerly known as Bill’s Gambling Hall and Barbary Coast also offers single zero roulette, 100x odds craps, and a bank of eight quarter video poker machines with playable games. The blackjack games above should certainly work for recreational blackjack players on the Vegas Strip. Once again, the single worst blackjack game on the Vegas Strip belongs to Caesars Palace. There are at least 8 blackjack games with a house edge of 2.43% at Caesars Palace. Here are some of the rules on this $10 blackjack game that should be avoided if possible. Caesars Palace and most casinos on the Vegas Strip offer blackjack games with different rules. Be sure to read the table to make sure you’re playing the game that best suits your needs.